Tauranga Port has a centralised location that is key for export commodity sources. With direct and dedicated access to New Zealand’s largest import market, they have unrivaled access and the capacity to expand our infrastructure. It is no longer simply New Zealand’s preferred single cargo gateway. They aim to be recognised as New Zealand’s Port for the Future by offering a range of preferred cargo gateways and shipping solutions that include and transcend the boundaries of our historic base in the Bay of Plenty. Their key strength lies in the ability to grow to meet customer requirements and market demands, which they will do by keeping focus on maintaining our core business at Tauranga, and also expanding into new ventures that are reshaping the traditions of service delivery in New Zealand’s port sector. This tanker berth was completed in 1980 and is dedicated to the transfer of dangerous goods in bulk. Activities include the discharging and/or loading of tankers carrying bulk fluids such as hydrocarbon oil products, chemicals and edible oils. A conveyor system can also used for loading woodchips. The facility consists of a free standing wharf of 80 metres in length with dolphins at each end allowing for ships of up to 250 metres LOA to berth and pump ashore. On the western side, this wharf opened in 1992, and the facility features 770m of heavy-duty wharf, seven container cranes and 27 hectares of paved container yard. 1828 – The visit of the missionary schooner Herald, probably the first European vessel to enter the harbour. 1873 – The Port of Tauranga was officially established by order of the Governor of New Zealand. 1882 – The Lady Jocelyn of 2,138 tonnes was the first large sailing vessel to enter the harbour. 1913 – First meeting of the Tauranga Harbour Board. 1927 – Railway Wharf at Tauranga was completed and used almost exclusively for coastal shipping until the visit of the James Cook in 1948 to load timber for Australia. 1953 – First pile driven for Mount Maunganui wharf. The first ship, the MV Korowai berthed at the new wharf on 5 December 1954. 1955 – Mount Maunganui Branch relaid with heavy track and reopened on 28 March 1955, for paper and timber products from Kawerau. 1967 – First container unloaded. 1972 – Port Caroline, the world’s largest conventional refrigerated cargo liner, visits the Port for the first time. 1979 – $3.9 million heavy lift multi-purpose gantry crane operational. 1985 – Establishment of Port of Tauranga Limited. 1988 – As a consequence of Government port reform, the Bay of Plenty Harbour Board is disestablished and Port of Tauranga Limited begins operations. 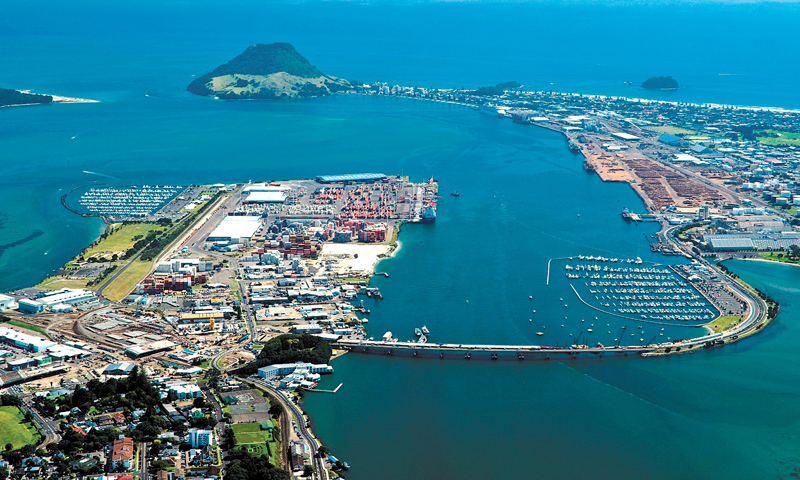 1992 – $100 million Tauranga Terminal development completed and wharves opened for shipping. 1999 – Port of Tauranga establishes New Zealand’s first fully integrated inland port service – MetroPort Auckland. 1999 – Australia-New Zealand Direct Line (ANZDL) becomes the first shipping line to use MetroPort Auckland. 2001 – Agreement between the Port of Tauranga and Tranz Rail to extend MetroPort Auckland to a seven-day-a-week service. 2002 – The purchase of a 100% stake in Owens Services BOP Limited, a log marshalling and cargo handling business. 2003 – The Mediterranean Shipping Company use Tauranga as its sole North Island port for its European service which commenced on 5 February 2003. 2003 – Ten year extension signed with Tranz Rail for the operation of MetroPort, allowing for further investments to upgrade MetroPort’s facilities. The MetroPort agreement expires in May 2013. 2004 – MetroPort’s throughput increases by 50%. Its capacity is to be doubled following a $3 million upgrade of the sealed area, ground slots and drainage. 2004 – The Port celebrated 50 years of operations. The MV Korowai was the first vessel to visit the Port on 5 December 1954. 2004 – The Port of Tauranga was a joint winner of the 2004 Australasian Port of the Year Award run by Lloyd’s List Daily Commercial News, the first time a New Zealand port has won a Lloyd’s List award. 2005 – Three new straddle carriers were introduced at Sulphur Point. 2006 – The first New Zealand call in the newly formed Maersk Line’s 4100 TEU “Pendulum” service commenced in February. This service provides New Zealand’s exporters with a weekly direct service to North America and Europe which includes trans-Tasman imports via Tauranga. 2006 – Tauranga was confirmed as the North Island port of call for Hamburg Sud’s new fortnightly Trident service commencing in March. The service takes exports to the East Coast of North America and Europe. 2008 – Total containers up 25% to 582,072 TEUs (twenty foot equivalent units). 2008 – Seatrade, the world’s largest specialist reefer shipping operator, announced plans to consolidate on Port of Tauranga. 2009 – Lodged application for dredging consent to dredge channels to 14.5 metres draught at low water. 2010 – Launch of CargoConnect, a comprehensive online cargo management system, allowing customers to manage their cargo movements at the Tauranga Container Terminal. 2010 – Purchase of Tapper Transport Group, New Zealand’s largest container transport company and container freight station. 2011 – Five new container services announced for Tauranga, adding a net 180 vessel visits a year. 2011 – Expansion of the Sulphur Point Container Terminal underway, including a 170-metre wharf expansion, more container storage land and the planned purchase of a sixth ship-to-shore gantry crane. 2012 – Ordering of sixth and seventh cranes. 2012 – 170 metre Sulphur Point wharf extension underway with completion due March 2013. March 2013 – consent granted for harbour dredging. 2013 – Container volumes increase 7% to 848,384 twenty foot equivalent units (TEU) consolidating Port of Tauranga’s position as New Zealand’s largest container terminal.